After the Bolshevik government withdrew from World War I, the Allied Powers openly backed the anti-communist White forces in Russia. Allied efforts were hampered by divided objectives, war-weariness from the overall global conflict, and a lack of domestic support. These factors, together with the evacuation of the Czechoslovak Legion, compelled the Allied Powers to withdraw from North Russia and Siberia in 1920, though Japanese forces occupied parts of Siberia until 1922 and the northern half of Sakhalin until 1925. In 1917, Russia was in a state of political strife, and public support for World War I and Tsar Nicholas II was dwindling. The country was on the brink of revolution. The February Revolution changed the course of the war; under intense political pressure, the Tsar abdicated and the Russian Provisional Government was formed, led initially by Georgy Lvov and later by Alexander Kerensky. The Provisional Government pledged to continue fighting the Germans on the Eastern Front. The Allied Powers had been shipping supplies to Russia since the beginning of the war in 1914 through the ports of Arkhangelsk, Murmansk, and Vladivostok. In 1917, the United States entered the war on the Allied side. US President Woodrow Wilson dropped his reservations about joining the war with the despotic Tsar as an ally, and the United States began providing economic and technical support to Kerensky's government. The war became unpopular with the Russian populace. Political and social unrest increased, with the Marxist anti-war Bolshevik Party under Vladimir Lenin gaining widespread support. Large numbers of common soldiers either mutinied or deserted the Imperial Russian Army. In the offensive of 18 June 1917, the Russian Army was defeated by the German and Austro-Hungarian forces as a result of a counter-attack. This led to the collapse of the Eastern Front. The demoralised Russian Army was on the verge of mutiny and most soldiers had deserted the front lines. Kerensky replaced Aleksei Brusilov with Lavr Kornilov as Commander-in-Chief of the Army. Kornilov attempted to set up a military dictatorship by staging a coup in late August 1917. He had the support of the British military attaché, Brigadier-General Alfred Knox, and Kerensky accused Knox of producing pro-Kornilov propaganda. Kerensky also claimed Lord Milner, member of the British War Cabinet, wrote him a letter expressing support for Kornilov. A British armoured car squadron commanded by Oliver Locker-Lampson and dressed in Russian uniforms participated in the failed coup. In 1917, the October Revolution led to the overthrow of Kerensky's provisional government, and the Bolsheviks assuming power. German troops invaded the Russian Empire and threatened to capture Moscow and impose its own regime in early 1918. Lenin wanted to cut a deal with Germany but was unable to get approval from his council until late February. Bolshevik Russia then switched sides and supported the German position. The Russian Soviet Federative Socialist Republic signed the Treaty of Brest-Litovsk. The Allied Powers felt betrayed and turned against the new regime, aiding its "White" enemies and landing troops to prevent Russian supplies from reaching Germany. The betrayal removed whatever reservations the Allied Powers had about overthrowing the Bolsheviks. According to William Henry Chamberlin, even before Brest-Litovsk, "Downing Street contemplated a protectorate over the Caucasus and the Quai d'Orsay over Crimea, Bessarabia and the Ukraine", and began negotiating deals for funding White generals to bring them into being. R. H. Bruce Lockhart and another British agent and a French official in Moscow tried to organize a coup that would overthrow the Bolshevik regime. They were dealing with double agents and were exposed and arrested. The Czechoslovak Legion was at times in control of most of the Trans-Siberian railway, all major cities in Siberia. The signing of the Treaty of Brest-Litovsk ensured that prisoners-of-war (POW) would be transferred to and from each country. Austro-Hungarian prisoners were of a number of various nationalities; some Czechoslovak POWs deserted to the Russian Army. Czechoslovaks had long desired to create their own independent state, and the Russians aided in establishing special Czechoslovak units (the Czechoslovak Legions) to fight the Central Powers. In 1917, the Bolsheviks stated that if the Czechoslovak Legions remained neutral and agreed to leave Russia, they would be granted safe passage through Siberia en route to France via Vladivostok to fight with the Allied forces on the Western Front. The Czechoslovak Legions travelled via the Trans-Siberian Railway to Vladivostok. However, fighting between the Legions and the Bolsheviks erupted in May 1918. The Allied Powers became concerned at the collapse of the Eastern Front and the loss of their Tsarist ally to communism, and there was also the question of the large quantities of supplies and equipment in Russian ports, which the Allied Powers feared might be seized by the Germans. Also worrisome to the Allied Powers was the April 1918 landing of a division of German troops in Finland, increasing speculation they might attempt to capture the Murmansk-Petrograd railway, and subsequently the strategic port of Murmansk and possibly Arkhangelsk. Other concerns regarded the potential destruction of the Czechoslovak Legions and the threat of Bolshevism, the nature of which worried many Allied governments. Meanwhile, Allied materiel in transit quickly accumulated in the warehouses in Arkhangelsk and Murmansk. Estonia had established a national army with the support of Finnish volunteers and were defending against the 7th Red Army's attack. Faced with these events, the British and French governments decided upon an Allied military intervention in Russia. Severely short of troops to spare, the British and French requested that President Wilson provide American soldiers for the campaign. In July 1918, against the advice of the United States Department of War, Wilson agreed to the limited participation of 5,000 United States Army troops in the campaign. This force, which became known as the "American North Russia Expeditionary Force" (a.k.a. the Polar Bear Expedition) were sent to Arkhangelsk while another 8,000 soldiers, organised as the American Expeditionary Force Siberia, were shipped to Vladivostok from the Philippines and from Camp Fremont in California. That same month, the Canadian government agreed to the British government's request to command and provide most of the soldiers for a combined British Empire force, which also included Australian and Indian troops. Some of this force was the Canadian Siberian Expeditionary Force; another part was the North Russia Intervention. A Royal Navy squadron was sent to the Baltic under Rear-Admiral Edwyn Alexander-Sinclair. This force consisted of modern C-class cruisers and V and W-class destroyers. In December 1918, Sinclair sailed into Estonian and Latvian ports, sending in troops and supplies, and promising to attack the Bolsheviks "as far as my guns can reach". In January 1919, he was succeeded in command by Rear-Admiral Walter Cowan. The Japanese, concerned about their northern border, sent the largest military force, numbering about 70,000. They desired the establishment of a buffer state in Siberia, and the Imperial Japanese Army General Staff viewed the situation in Russia as an opportunity for settling Japan's "northern problem". The Japanese government was also intensely hostile to communism. The Italians created the special "Corpo di Spedizione" with Alpini troops sent from Italy and ex-POWs of Italian ethnicity from the former Austro-Hungarian army who were recruited to the Italian Legione Redenta. They were initially based in the Italian Concession in Tientsin and numbered about 2,500. Romania, Greece, Poland, China, and Serbia also sent contingents in support of the intervention. 1,300 Italians in the Murmansk region. British Army: 236th Infantry Brigade, 6th Battalion Royal Marine Light Infantry (RMLI), 548th (Dundee) Army Troops Company, Royal Engineers, 2/10th (Cyclist) Battalion, Royal ScotsRoyal Scots, 52nd Battalion, Manchester Regiment, and elements of the Royal Dublin Fusiliers. Slavo-British Allied Legion (SBAL): a British-trained and led contingent composed mostly of expatriate Russian anti-Bolshevik , Finnish and Estonian volunteers (including Dyer's Battalion). Royal Air Force: contingent comprising Airco DH.4 bombers, Fairey Campania and Sopwith Baby seaplanes along with a single Sopwith Camel fighter. North Russia Expeditionary Force (also known as the Polar Bear Expedition): approximately 8,000 personnel from the US Army, including the: 310th Engineers, 339th Infantry, 337th Field Hospital, and 337th Ambulance Company. Also the 167th and 168th Railroad Companies, which were sent to Murmansk to operate the Murmansk to Petrograd line. France: 2,000 French Army personnel, mainly from the Armée coloniale (e.g. the 21st Colonial Battalion) and engineers. Other countries: 1,000 Serbian and Polish infantry attached to White Russian forces in the north (as distinct to those in Siberia forces, which included the Czechoslovak Legion); a small number of volunteers from countries such as Italy. Although the Estonian Army had attained control over its country, the opposing 7th and Estonian Red Armies were still active. The Estonian High Command decided to push their defense lines across the border into Russia in support of the White Russian Northern Corps. They went on offensive at Narva, catching the Soviets by surprise and destroying their 6th Division. The attack was supported along the Gulf of Finland's coast by Royal Navy and the Estonian Navy and marines. With the front approaching, the garrison of the Krasnaya Gorka fort mutinied. But the 7th Red Army received reinforcements and counterattacked, pushing the White Russians back, until the front was stabilised with the support from the Estonian 1st Division at the Luga and Saba Rivers. The Estonian Pskov offensive commenced simultaneously on 13 May 1919. Its Petseri Battle Group destroyed the Estonian Red Army, captured the town on 25 May, and cleared the territory between Estonia and the Velikaya River. A few days later, the Northern Corps forces arrived in Pskov. On 19 June 1919, the Estonian Commander-in-Chief Johan Laidoner rescinded his command over the White Russians, and they were renamed the Northwestern Army. Shortly afterward, General Nikolai N. Yudenich took command of the troops. The next offensive of the Northwestern Army was planned on 10 July 1919, but the armaments and supplies expected from the Allies did not arrive. Nor did the Estonians desire to proceed with the fruitless war since with the initial peace approach of April 1919 the Russian Bolshevik government already guaranteed the recognition of the independent Estonian state. So when British Gen. Gough requested on 8 August Estonians for the military assistance to Yudenich, Estonians in return asked both Yudenich and the Allies to recognise their state first. Gough's deputy, Brigadier Gen. Frank Marsh required Yudenich to immediately issue a statute that would establish the Government of the North-West Russian Region encompassing Petrograd, Pskov and Novgorod Governorates that would officially guarantee de-jure recognition of Estonia. On 16 August Times made the deal public that angered the Foreign Office and the War Cabinet, and caused a decline in further military aid to Yudenich. However, the Northwestern Army launched operation White Sword, the last major effort to capture Petrograd on 9 October, with arms provided by Britain and France, and the operational support by the Estonian Army, Estonian Navy, and the Royal Navy. The Estonian and British forces made a joint land and naval attack against Krasnaya Gorka, while the Estonian 2nd Division attempted to throw the 10th Red Division across the Velikaya, and the 3rd Division attacked toward Pytalovo and Ostrov. The Northwestern Army approached to within 16 km (10 mi) of Petrograd, but the Red Army repulsed them back to the Narva River. Distrustful of the White Russians, the Estonian High Command disarmed and interned the remains of the Northwestern Army that retreated behind the state border. On 18 December 1918, a month after the armistice, the French occupied Odessa and Sevastopol. This began the intervention in southern Russia (later Ukraine) which was to aid and supply General Denikin's White Army forces, the Volunteer Army, fighting the Bolsheviks there. The campaign involved mainly French and Greek troops. By April 1919, they were withdrawn after an attack by Nikifor Grigoriev's Army before the defeat of the White Army's march against Moscow. General Wrangel reorganized his army in the Crimea; however, with the deteriorating situation, he and his soldiers fled Russia aboard Allied ships on 14 November 1920. After the Bolshevik forces of the Rumcherod attacked the region of Bessarabia, the Romanian government of Ion I. C. Brătianu decided to intervene, and on January 26 [O.S. January 13] 1918, the 11th Infantry Division under General Ernest Broșteanu entered Chișinău. The Bolshevik troops retreated to Tighina, and after a battle retreated further beyond the Dniester. The battle of Tighina was one of the two significant engagements of the 1918 Bessarabian Campaign. It lasted for five days, between 20 and 25 January, and ended in a Romanian victory, albeit with significant Romanian casualties (141 dead). Romanian troops captured 800 guns. The second important battle was fought at Vâlcov, between 27 January and 3 February. The actions of Bolshevik warships (including three Donetsk-class gunboats), managed to delay the Romanians for several days, but the ships had to retreat on 3 February due to no longer being able to adjust and correct their aiming, after Romanian artillery destroyed the shore-based Bolshevik artillery observation posts. Later that day, Romanian troops occupied Vâlcov. The Romanians captured the Russud-class landing craft K-2 as well as several more barges armed with a total of eight 152 mm Obuchov guns. The joint Allied intervention began in August 1918. The Japanese entered through Vladivostok and points along the China–Russia border with more than 70,000 troops eventually being deployed. The Japanese were joined by British and later American, Canadian, French, and Italian troops. Elements of the Czechoslovak Legion that had reached Vladivostok, greeted the Allied forces. The Americans deployed the 27th Infantry and 31st Infantry regiments out of the Philippines, plus elements of the 12th, 13th and 62nd Infantry Regiments out of Camp Fremont. The Japanese were expected to send only around 7,000 troops for the expedition, but by the end of their involvement in Siberia had deployed 70,000. The deployment of such a large force for a rescue operation made the Allied Powers wary of Japanese intentions. On 5 September, the Japanese linked up with the vanguard of the Czech Legion, a few days later the British, Italian and French contingents joined the Czechs in an effort to re-establish the Eastern Front beyond the Urals; as a result the European Allied Powers trekked westward. The Canadians largely remained in Vladivostok for the duration. The Japanese, with their own objectives in mind, refused to proceed west of Lake Baikal. The Americans, suspicious of Japanese intentions, also stayed behind to keep an eye on them. By November, the Japanese occupied all ports and major towns in the Russian Maritime Provinces and Siberia east of the city of Chita. The Allied Powers lent their support to White Russian elements from the summer of 1918. There were tensions between the two anti-Bolshevik factions; the White Russian government led by Admiral Alexander Kolchak and the Cossacks led by Grigory Semyonov and Ivan Kalmykov which also hampered efforts. All Allied forces were evacuated by 1920, apart from the Japanese who stayed until 1922. In 1917, Dunsterforce, an Allied military mission of under 1,000 Australian, British, and Canadian troops (drawn from the Mesopotamian and Western Fronts), accompanied by armoured cars, deployed from Hamadan some 350 km (220 mi) across Qajar Persia. It was named after its commander General Lionel Dunsterville. Its mission was to gather information, train and command local forces, and prevent the spread of German propaganda. Later on, Dunsterville was told to take and protect the Baku oil fields. The force was initially delayed by 3,000 Russian Bolshevik troops at Enzeli but then proceeded by ship to the port of Baku on the Caspian Sea. This was the primary target for the advancing Ottoman forces and Dunsterforce endured a short, brutal siege in September 1918 before being forced to withdraw. However, having been defeated in World War I, the Ottoman Empire had to withdraw its forces from the borders of Azerbaijan in the middle of November 1918. Headed by General William Thomson, the British troops of 5,000 soldiers arrived in Baku on 17 November, and martial law was implemented on the capital of Azerbaijan Democratic Republic until "the civil power would be strong enough to release the forces from the responsibility to maintain the public order". Allied military action began on 11 August 1918, when General Malleson intervened in support of the Ashkhabad Executive Committee, who had ousted the Tashkent Soviet Bolsheviks from the western end of the Trans-Caspian Railway in July 1918. Malleson had been authorised to intervene with Empire and British troops, in what would be referred to as the Malleson Mission. He sent the Machine Gun Section of the 19th Punjabi Rifles to Baýramaly located on the Trans-Caspian railway. After combat at Merv, they were joined by the rest of the regiment. There was further action at Kaka on 28 August 11 and 18 September. They were reinforced on 25 September by two squadrons of the 28th Light Cavalry. Fighting alongside Trans-Caspian troops, they subsequently fought at Arman Sagad (between 9 and 11 October) and Dushak (14 October). By 1 November, they had re-occupied Merv and on instructions of the British government, halted their advance and took up defensive positions at Bairam Ali. The Trans-Caspian forces continued to attack the Bolsheviks to the north. After the Trans-Caspian forces were routed at Uch Aji, their commander Colonel Knollys sent the 28th Cavalry to their support at Annenkovo. In January 1919, one company of the 19th Punjabi Rifles was sent to reinforce the position at Annenkovo, where a second battle took place on 16 January. The British Government decided on 21 January to withdraw the force, and the last troops left for Persia on 5 April. The Allied Powers withdrew in 1920. The Japanese military stayed in the Maritime Provinces of the Russian Far East until 1922 and in northern Sakhalin until 1925, following the signing of the Soviet–Japanese Basic Convention in Beijing, in which Japan agreed to withdraw its troops from Russia. In return, the Soviet Union agreed to honor the provisions of the Treaty of Portsmouth. Historical assessment of the intervention has been universally negative. Frederick L. Schuman wrote that the consequences of the expedition "were to poison East-West relations forever after, to contribute significantly to the origins of World War II and the later 'Cold War,' and to fix patterns of suspicion and hatred on both sides which even today threaten worse catastrophes in time to come." Modern historian Robert Maddox summarised, "The immediate effect of the intervention was to prolong a bloody civil war, thereby costing thousands of additional lives and wreaking enormous destruction on an already battered society." ^ Scientia Militaria, South African Journal of Military Studies, Vol 15, Nr 4, 1985, pp. 46-48. Accessed January 24, 2016. ^ Bradley, Czechoslovak Legion, 156. ^ Foglesong, David S. (1 February 2014). "Introduction". America's Secret War against Bolshevism: U.S. Intervention in the Russian Civil War, 1917-1920. UNC Press Books. pp. 4–6. ISBN 9781469611136. ^ Davis, Donald E.; Trani, Eugene P. (26 August 2002). The First Cold War: The Legacy of Woodrow Wilson in U.S. - Soviet Relations. University of Missouri Press. pp. 92–95. ISBN 9780826263452. ^ a b c Beyer, pp. 152–53. ^ Robert Service (2000). Lenin: A Biography. p. 342. ^ John W. Long, "Plot and counter‐plot in revolutionary Russia: Chronicling the Bruce Lockhart conspiracy, 1918." Intelligence and National Security 10#1 (1995): 122–143. ^ a b c Jaan Maide (1933). Ülevaade Eesti vabadussõjast 1918—1920 (Estonian War of Independence 1918—1920: Overview) (in Estonian). Tallinn: Estonian Defence League. ^ Olson, John Stuart; Pappas, Lee Brigance; Pappas, Nicholas Charles (1994). An Ethnohistorical Dictionary of the Russian and Soviet Empires. Greenwood Publishing. p. 273. ^ a b A History of Russia, 7th Edition, Nichlas V. Riasanovsky & Mark D. Steinberg, Oxford University Press, 2005. ^ Joana Breidenbach (2005). Pál Nyíri, Joana Breidenbach, ed. China inside out: contemporary Chinese nationalism and transnationalism (illustrated ed.). Central European University Press. p. 90. ISBN 963-7326-14-6. Retrieved 18 March 2012. "At the end of the year 1918, after the Russian Revolution, the Chinese merchants in the Russian Far East demanded the Chinese government to send troops for their protection, and Chinese troops were sent to Vladivostok to protect the Chinese community: about 1600 soldiers and 700 support personnel." As well, there were reports of Canadian soldiers fighting Kettites, Chinese Communists (perhaps left-wing adventurers), in the Murmansk area (as recorded in war diary of E.H. Cope, North Russia Expeditionary Force, Provincial Archives of Alberta, 68.101/3). ^ Moffat, Ian C. D. "Forgotten Battlefields – Canadians in Siberia 1918 – 1919". Canadian Military Journal. Department of National Defence. Retrieved 8 April 2017. ^ The British 6th Battalion Royal Marines Light Infantry (RMLI) was scratched together from a company of the Royal Marine Artillery and companies from each of the three naval port depots. Very few of their officers had seen any land fighting. Their original purpose had been only to deploy to Flensburg to supervise a vote to decide whether northern Schleswig-Holstein should remain German or be given to Denmark. Many of the Marines were less than 19 years old; it would have been unusual to send them overseas. Others were ex-prisoners of war who had only recently returned from Germany and had no home leave. There was outrage when on short notice, the 6th Battalion was shipped to Murmansk, Russia, on the Arctic Ocean, to assist in the withdrawal of British forces. Still not expecting to have to fight, the battalion was ordered forward under army command to hold certain outposts. ^ "British Military Aviation in 1918 – Part 2". Rafmuseum.org. 6 June 1918. Archived from the original on 30 June 2012. Retrieved 28 April 2012. ^ Bowyer, Chaz (1988). RAF Operations 1918–1938. London: William Kimber. p. 38. ISBN 0-7183-0671-6. ^ Jon., Smele,. Historical dictionary of the Russian civil wars, 1916-1926. Lanham, Maryland. ISBN 9781442252806. OCLC 907965486. ^ 1951-, Moffat, Ian C. D.,. The allied intervention in Russia, 1918-1920 : the diplomacy of chaos. Houndsmills, Basingstoke, Hampshire. pp. 242–244. ISBN 9781137435736. OCLC 909398151. ^ Fletcher, William A. (1976). "The British navy in the Baltic, 1918–1920: Its contribution to the independence of the Baltic nations". Journal of Baltic Studies. 7 (2): 134–144. doi:10.1080/01629777600000141. ^ Willett, Robert L. (2003). Russian Sideshow. Washington: Brassey's. pp. 166–167. ISBN 1574884298. ^ a b c d e f g Humphreys, Leonard A. (1995). The Way of the Heavenly Sword: The Japanese Army in the 1920s. Stanford University Press. p. 26. ISBN 0804723753. ^ League of Nations Treaty Series, vol. 34, pp. 32-53. ^ Frederick L. Schuman, Russia Since 1917: Four Decades of Soviet Politics (New York: Alfred A. Knopf, 1957), 109. Foglesong, David S. "Policies Toward Russia and Intervention in the Russian Revolution." in Ross A. Kennedy ed., A Companion to Woodrow Wilson (2013): 386–405. Isitt, Benjamin (2010). From Victoria to Vladivostok: Canada's Siberian Expedition, 1917-19. University of British Columbia Press. ISBN 978-0-7748-1802-5. Archived from the original on 6 July 2011. Isitt, Benjamin (2006). "Mutiny from Victoria to Vladivostok, December 1918". Canadian Historical Review. University of Toronto Press. 87 (2): 223–264. Archived from the original on 6 July 2011. Long, John W. "American Intervention in Russia: The North Russian Expedition, 1918–19." Diplomatic History 6.1 (1982): 45–68. Plotke, AJ (1993). Imperial Spies Invade Russia. Westport CT, London: Greenwood Press. ISBN 0-313-28611-6. Unterberger, Betty Miller. "Woodrow Wilson and the Bolsheviks: The "Acid Test" of Soviet–American Relations." Diplomatic History 11.2 (1987): 71–90. Willett, Robert L. (2003). Russian Sideshow: America's Undeclared War, 1918–1920. Washington D.C.: Brassey's. ISBN 1-57488-429-8. Wikimedia Commons has media related to Allied Intervention in the Civil war of Russia. Beyer, Rick (2003). The Greatest Stories Never Told. A&E Television Networks / The History Channel. ISBN 0-06-001401-6. The Far Eastern Republic, sometimes called the Chita Republic, was a nominally independent state that existed from April 1920 to November 1922 in the easternmost part of the Russian Far East. Although nominally independent, it was largely controlled by the Russian Soviet Federative Socialist Republic (RSFSR) and its main purpose was to be a buffer state between the RSFSR and the territories occupied by Japan during the Russian Civil War. Its first president was Alexander Krasnoshchyokov. Polish 5th Siberian Rifle Division was a Polish military unit formed in 1919 in Russia during the aftermath of World War I. The division fought during the Polish-Bolshevik War, but as it was attached to the White Russian formations, it is considered to have fought more in the Russian Civil War. Its tradition was continued in the Polish Army as the 30th Infantry Division. The American Expeditionary Force, North Russia was a contingent of about 5,000 United States Army troops that landed in Arkhangelsk, Russia as part of the Allied intervention in the Russian Civil War and fought the Red Army in the surrounding region during the period of September 1918 through to July 1919. The North Russia Intervention, also known as the Northern Russian Expedition, the Archangel Campaign, and the Murman Deployment, was part of the Allied Intervention in Russia after the October Revolution. The intervention brought about the involvement of foreign troops in the Russian Civil War on the side of the White movement. While the movement was ultimately defeated, the Allied forces fought notable ending defensive actions against the Bolsheviks in the battles of Bolshie Ozerki, allowing them to withdraw from Russia in good order. The campaign lasted from 1918, during the final months of World War I, to 1920. The American Expeditionary Force, Siberia was a formation of the United States Army involved in the Russian Civil War in Vladivostok, Russia, during the end of World War I after the October Revolution, from 1918 to 1920. The force was part of the larger Allied North Russia Intervention. As a result of this expedition early relations between the United States and the Soviet Union were poor. The Canadian Siberian Expeditionary Force was a Canadian military force sent to Vladivostok, Russia, during the Russian Revolution to bolster the allied presence, oppose the Bolshevik Revolution and attempt to keep Russia in the fight against Germany. Composed of 4,192 soldiers and authorised in August 1918, the force returned to Canada between April and June 1919. The force was commanded by Major General James H. Elmsley. During this time, the C.S.E.F. saw little fighting, with fewer than 100 troops proceeding "up country" to Omsk, to serve as administrative staff for 1,500 British troops aiding the anti-Bolshevik White Russian government of Admiral Alexander Kolchak. Most Canadians remained in Vladivostok, undertaking routine drill and policing duties in the volatile port city. The Hungarian–Romanian War was fought between the First Hungarian Republic and the Kingdom of Romania. Hostilities began on 13 November 1918 and ended on 3 August 1919. The Romanian Army occupied eastern Hungary until 28 March 1920. The Russian Civil War (1917–1921) began after the provisional government collapsed and the Bolshevik party assumed power in October 1917. The principal fighting occurred between the Bolshevik Red Army and the forces of the White Army, a group of loosely allied anti-Bolshevik forces. During the war several foreign armies took part, mostly fighting against the Red Army—including the Western allies—and many foreign volunteers fought for both sides. Other nationalist and regional political groups also participated in the war, including the Ukrainian nationalist Green Army, the Ukrainian anarchist Black Army and Black Guards, and warlords such as Ungern von Sternberg. Despite some pressure from Britain, the Australian Prime Minister, William Hughes, had refused to commit forces to Russia following the end of World War I in 1918. 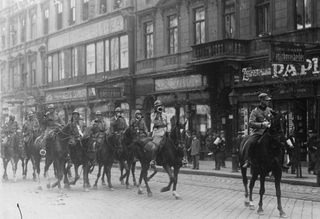 The Revolt of the Czechoslovak Legion was the armed actions of the Czechoslovak Legions in the Russian Civil War against Bolshevik authorities during May – August, 1918, in Volga, Siberia and Ural regions. This event made possible the anti-Bolshevik activity of the Committee of Members of the Constituent Assembly. The Siberian Army was an anti-Bolshevik army during the Russian Civil War, which fought from June 1918 – July 1919 in Siberia – Ural Region. Murmańczycy was a common name for Polish military formations which fought against the Bolsheviks in the area of Murmansk and Arkhangelsk, northern Russia, in 1918–1919. They were part of the Allied intervention in the Russian Civil War. Kikuzo Otani was a general in the Imperial Japanese Army. Otani participated in the First Sino-Japanese War, Russo-Japanese War, World War I and the Russian Civil War. During the course of the latter he commanded the Vladivostok Expeditionary Force and became the formal commander of the Allied Siberian Intervention. He was elevated to baron upon his retirement in 1920. The Supreme Administration of the Northern Region was a White movement, Anti-Bolshevik left-wing, and Allied government.